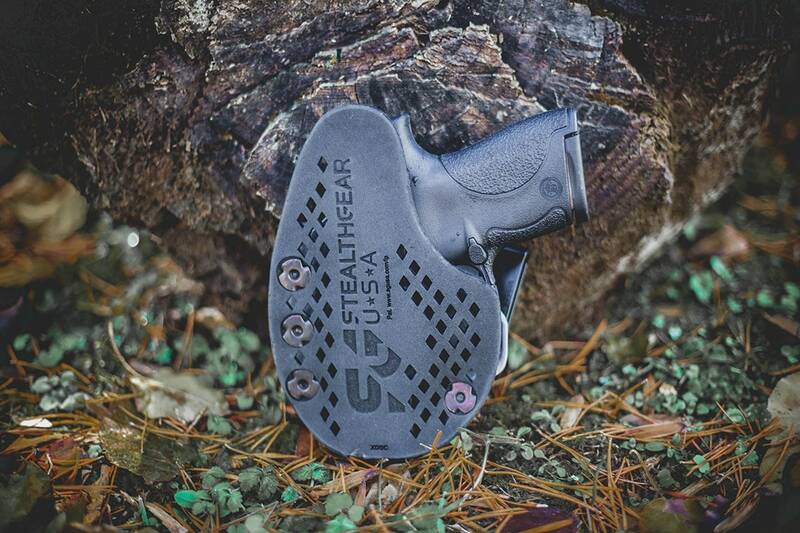 StealthGear USA brings a minimalistic style to its holster series in the Revolution lineup. Introduced in late 2016, the Revolution is a small departure from the company’s signature Ventcore design. Namely, in the backing StealthGear opts to use for the Revolution. StealthGear USA provided Guns.com with two variants – the IWB-Mini and AIWB – to try our hands at to determine if the Revolution models stack up against the Ventcore series. 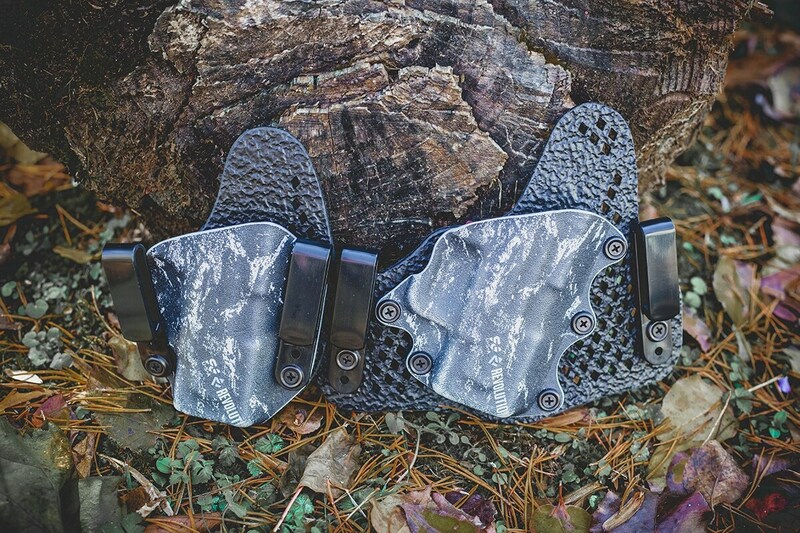 The Revolution holster series adopts the basic style of its predecessor, the Ventcore. Featuring a molded Kydex shell mounted to a backing, the Revolution’s basic shape is very similar to that of the Ventcore. That’s where the similarities end, though. The Revolution series looks towards an ultra-lightweight design, slim in build yet durable to withstand the rigors of every day carry. It does this by pairing the Kydex shell to a proprietary ACX-57 polymer backing. The polymer backing is light with a foam-like feel. The backing is ventilated using laser-cut ports shaped like diamonds to allow the material to breathe during use. This design, though a little odd to look at it, helps keeps wearer cool and dry and prevents a swampy mess during summer months. The polymer material is flexible, easily molding to the shape of the user which creates better concealment. While the polymer certainly does offer a weight reduction and, in my opinion, is easier to clean it doesn’t quite attain the comfort level of the Ventcore system. There’s just something about that plushy Ventcore feel that the Revolution just can’t beat. That being said, the Ventcore is a sweaty in the summer months as temperature rise and that plushy material retains heat. 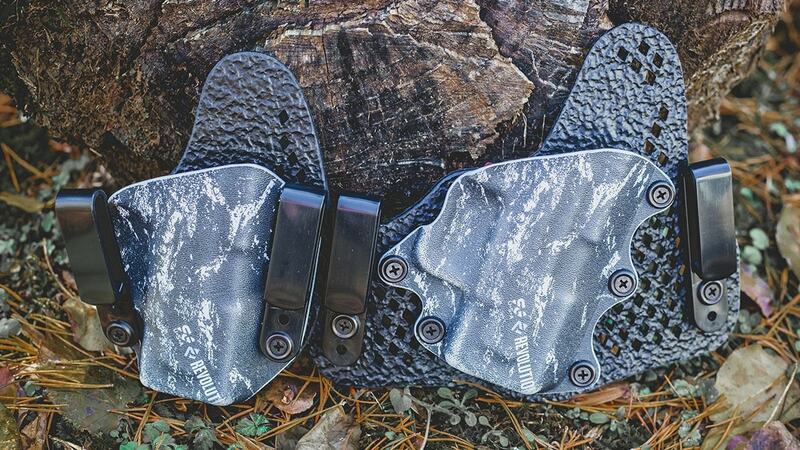 For that reason, Revolution shines as an exceptional summer holster option. The differences between the IWB-Mini and AIWB rigs are minuet, coming down to small aesthetics catering to the modes of carry. The Revolution IWB-Mini is a smaller version of the company’s standard IWB and works well for concealed carrier’s choosing to carry strong side IWB. The IWB-Mini uses two plastic belt clips to mount to the belt. The Revolution AIWB holster boasts a standard AIWB design, looking to remain compact for appendix carry. The AIWB offers a small footprint and generally keeps to the look of previous AIWB holsters from StealthGear USA; however, the Revolution series adds a secondary belt clip to its rig for added stability. Normally, I’m a one belt clip kind-of-gal but in the case of the Revolution, the belt clips feel a little thin and thus having two seems like the best idea to ensure an even weight distribution and reduced chance of breaking. The Revolution IWB-Mini is just large enough to accomplish what it needs to as a dedicated IWB rig but small enough that it doesn’t feel like it’s massively protruding from the waistline. It delicately walks the line between just enough but not too much. Paired to a Smith & Wesson Shield in 9mm at the 4-5 o’clock position, the IWB-Mini basically disappears under most of my clothing choices. The belt clips work to pull the holster towards my body while the polymer backing molds to the shapes, lumps and bumps of my body. Furthermore, the IWB-Mini is comfortable. On first look, the backing had me a little puzzled and though it’s not as comfortable as its predecessor the Ventcore, the IWB-Mini works just fine for a holster looking to shed a few ounces. While I happily tried out the IWB-Mini, the real bread and butter for me was in the AIWB rig. The AIWB features a standard appendix style but with StealthGear’s commitment to a compact creation, I was curious how the AIWB would actually conceal on my petite frame. Again, paired with the Smith & Wesson Shield, the AIWB was like a magician disappearing once my shirt tail was dropped. Riding around my centerline, the dual belt clips drew the gun in and securely held it in place. The slim Kydex mold retained the gun but didn’t add bulk which, for a micro warrior like me, is a bonus. In most scenarios, I am forced to either purchase holsters with claws or wedges or create my own to achieve the best concealment in AIWB; however, the Revolution AIWB requires neither of those options. I was simply able to throw the Revolution on and go. StealthGear’s Revolution uses the benefits of Kydex to offer retention yet not impact drawing. The backing is smooth on the wearer’s side but pebbled on the firearm side. I was curious if that would impact draw speeds or if it was more of an aesthetical choice. Turns out, it does nothing for draw and is simply there to look pretty by all accounts. 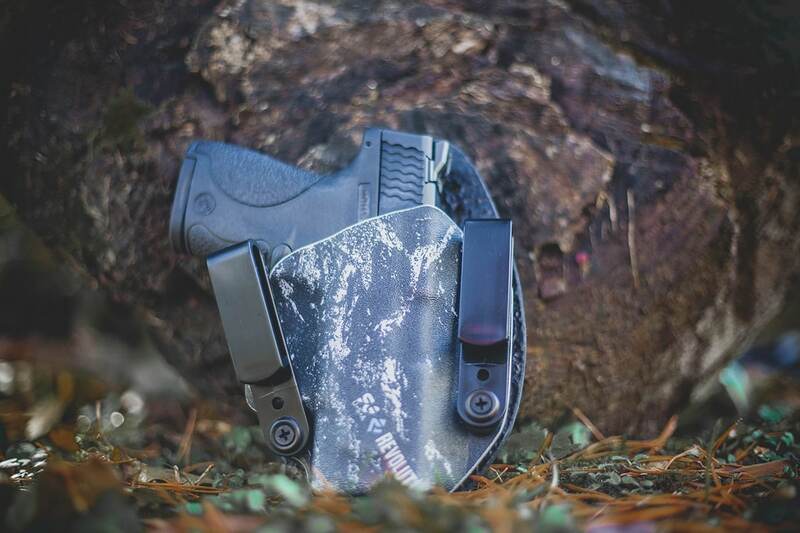 While the Revolution doesn’t quite attain the mystical qualities of its predecessor the Ventcore, the Revolution series does offer an ultra-lightweight holster set perfect for carry during hot months of the year. With its polymer, laser-cut backing and slim Kydex profile it’s the perfect addition to any summer wardrobe. The Revolution IWB-Mini and AIWB holsters are both available through StealthGear USA and priced around $60.